I don’t remember this grassy area as being a former plot of bamboo, but the growth patterns suggest it was and I must have been looking the other way (or for traffic) all the other times I was here. 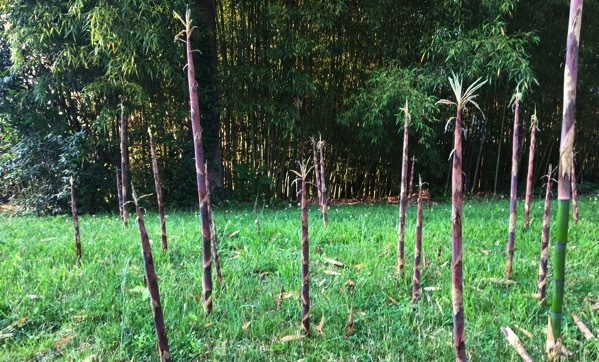 Now, the bamboo is aggressively expanding its territory—boldly shooting up everywhere. I wonder how fast these shoots grow—a half-foot a day? When I shot today’s neighborhood image, I was about the line of large-size toy vehicles to the (my) right of the front door, and the chairs on the left…overseeing the action. 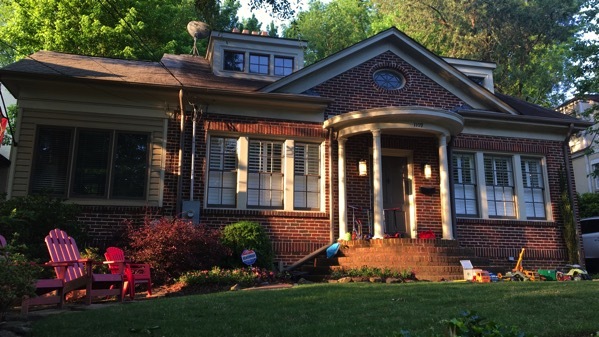 However, when I looked at the picture I thought: hey, is that a Weber grill on the roof? Second thought: must be a satellite dish…heh. This entry was posted on Saturday, 12 May 2018 at 7:01 pm.